In early December, once all of the surrounding perennials have departed for the winter, I have a striking view out my kitchen window. A lime-green trident glows against the stone wall in the morning light. It is a hart’s tongue fern, and it spends most of the year hidden by its neighbors. I didn’t realize that hart’s tongue fern was evergreen, as I have only once seen it in the wild, and that was in summer. My fern is not the local genotype, A. scolopendrium var. americanum. Mine is the progeny of a plant donated to Cornell Plantations by a local plant enthusiast, who knew it was not the local genotype, but could not remember whether it was of European or Mexican origin. I am betting on the first, A. scolopendrium var. scolopendrium, partly because the European variety is common in cultivation and partly because it has been bred to have around 200 cultivars (Ref. 3 p224 & Ref. 4), including many with striking leaf variations. My plant has a strong tendency toward split, almost crested, frond tips. If I had ready access to a lab, perhaps I could be certain, as the European hart’s tongue fern is diploid, while the American variety is tetraploid (double the "usual" number of chromosomes, sometimes seen in hybrids). (The Mexican version is A. scolopendrium var. lindenii, but I have not found much information on the variety (Ref. 2 & 7)). 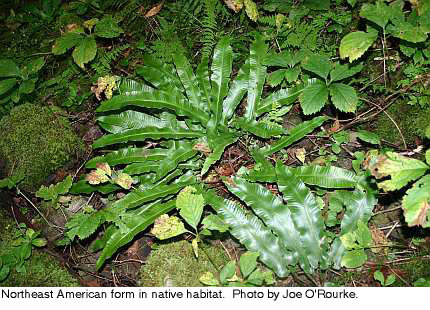 The American hart’s tongue fern is state and federally listed as threatened, globally imperiled, and generally rare and very patchy throughout its range. It is currently known from two counties in NY, but ranges into New Brunswick, the Bruce Peninsula of Ontario, and Upper Michigan, with two disjunct populations in cool sinkholes and caves of Tennessee and Alabama. According to Don Leopold, the first discovery of this species in North America was at a central NY site in 1807, and the NY sites represent 9% of the US populations (Ref. 4). The European plants are much more wide-ranging both ecologically and geographically, and are relatively speaking, common, whereas the North American plants are very rare and local. As described below, this more exacting nature extends to its suitability to cultivation. Hart’s tongue fern is quite distinctive when seen outside of a garden (where anything goes). The easy way to remember the look of this fern is given by Wikipedia. "The tongue-shaped leaves have given rise to the common name ‘Hart's tongue fern’. The sori pattern is reminiscent of a centipede's legs, and scolopendrium is Latin for ‘centipede’." The European variety is common in England, France and Germany, where it can be found on limestone walls of old churches & gardens and in calcareous ravines. It can also be found in scattered locations elsewhere in Europe. The American variety shows a similar preference for neutral to limy soil, rocks, and high humidity. 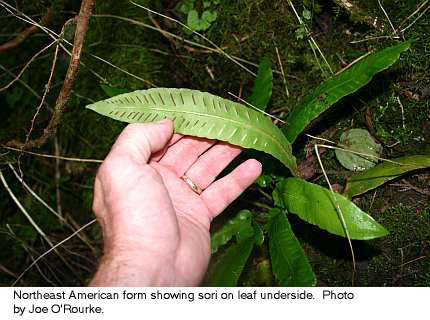 American hart’s tongue fern is found on wet limestone cliffs, cave entrances, and outcrops (Ref. 1). In New York they are generally found on north-facing slopes (mid-slope position) under deciduous canopy or in glacial plunge basins and narrow meltwater channels with high humidity (Ref. 4). Although earlier texts state that both American and European varieties can be grown "if natural conditions are simulated" (Ref. 3), more recent texts strongly differ. To start with, several references note that part of the reason for the scarcity of the North American variety is due to plant collectors. William Cullina summarizes the experience of the New England Wildflower Society’s Garden in the Woods this way: Asplenium scolopendrium var. americanum has a "well-deserved reputation that is far less amiable [than the European variety]" ... [It has] proven recalcitrant in cultivation and quickly perishes even under expert care ... [As a] rare species, even spore collection is discouraged ... (Ref. 1)." And why would you want to? A rare species which dies on the experts? The Garden in the Woods opted to grow the European variety as a substitute. The European variety grows very well in gardens and provides all the visual benefits of the native one. It can be started easily from spores and transplants well. This time, ethics, morality, and practicality all lead to the same conclusion. If you are so lucky as to see a wild hart’s tongue fern in the North American woods, leave every bit of it there. Take pictures. Wish it well. Don’t reveal the location! 1. 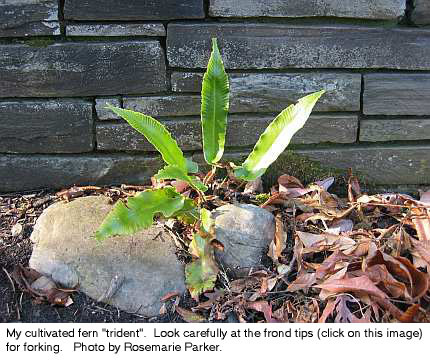 Cullina, William, New England Wildflower Society, Native Ferns, Moss & Grasses, Frances Tenenbaum, 2008, p36-37. 3. Foster, F. Gordon, Ferns to Know & Grow, 2nd revised ed., Hawthorne Books, 1976, p152-153. 4. Leopold, Donald J., Native Plants of the Northeast, Timber Press, 2005, p40.